Objects or finds recovered from archaeological sites on land or underwater need to be recorded and photographed. Every object can initially be recorded using the same set of measurements with further detailed recording completed for particularly interesting or significant objects. Specific types of objects such as anchors and cannons should also be recorded using standard procedures so we can ensure that the correct measurements are recorded in a standard way. The record made of an object may be the only evidence of that object having existed so it is important that the records you make are correct and complete. Recovery of objects from archaeological sites needs to be done with care. Ensure that the appropriate conservation facilities are available before the object is recovered. Ensure that any recovery of finds complies with local laws and requirements for reporting recoveries. 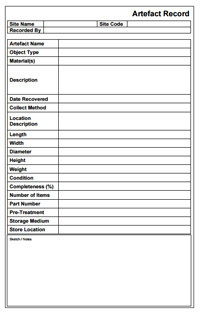 Information about an object can be recorded on a finds recording form. By filling in the form we ensure that for each object all of the required information is collected in a standard way. It is possible to record the objects just by making notes but it is likely that some essential piece of information will be forgotten. Using a standard way of recording across a number of sites we can more easily compare objects from a site and compare them between archaeological sites, learning more about differences and similarities between the sites in the process. The individual fields on the form are described below. For the initial finds record the object should be cleaned as little as possible. Objects made of metal, ceramic and stone can be gently washed as can larger pieces of timber that are in good condition. Poor condition timber, delicate objects and most organic materials should be dealt with by the conservation lab. The dimensions of objects can be measured using a folding rule. For smaller objects a pair of digital outside callipers can be used, these are particularly useful when there are many objects to record as they are quick as the measurement can simply be copied from the digital display. It is worth adding a sketch of any significant details on the object to the recording form or on a separate sheet. Complicated curved shapes that may help identify an object can be captured using a profile gauge and copied on to the form. Photographs of the object can be extremely useful; the recording form captures the basic information about the object but a picture can tell you far more. Information about how to photograph objects can be found on the page about Photographing Finds. There may be a convention for names of finds for the site where the object was found or in the region where the site lies, if so then follow the same convention for any new finds. If there is no convention then there are naming schemes which work well and others that are less useful. Numbering all the finds in sequence from 1 works well, but often it is advisable to put a letter or a code in front to show that this is an artefact or find, so an example name could be 'A283'. Where there are a lot of finds it is often useful to add a year code to the artefact name, so an object recovered in 2015 would be given a name such as '15A283'. When comparing finds from different sites the site code can be added to the name. Avoid using complicated codes to differentiate between finds of different types. This was once useful when records were kept on paper but with records kept in Site Recorder or in a database the objects can be filtered and sorted more easily using their recorded properties. The common name for the site where the object was found. The site code for the site where the object was found. The name of the person who recorded the object. The name or number of the object. The most useful numbering scheme is a two digit year code, the letter A then digits representing the number of the find, such as ‘15A61’. A simple name for the type of object, such as ‘Spoon’, ‘Musket’ etc. Use standard terms from a word list or thesaurus where possible. The types of materials used to make up the object with the most significant listed first. A short description of the object. The date the object was recovered. The dimensions of the object in millimetres. Use the appropriate dimensions, record each dimension across the widest point and include any additional measurements in the notes. The weight of the object in kilogrammes. This is the number of items that are included on this recording form, used for bulk recording of simple finds of the same type. The medium used to store the Artefact, select from: Salt water | Fresh water | wrapped | boxed.